I am DISGUSTED at this video of boy scout leaders toppling a rock formation in Goblin Valley State Park. He’s the owner of NoBounds IT. The unusual stone shapes in Goblin Valley result from the weathering of Entrada Sandstone. They consist of debris eroded from former highlands and redeposited on a former tidal flat of alternating layers of sandstone, siltstone and shale. The rocks show evidence of being near an ancient sea with the ebb and flow of tides, tidal channels that directed currents back to the sea and coastal sand dunes. Joint or fracture patterns within the Entrada’s sandstone beds created initial zones of weakness. The unweathered joints intersected to form sharp edges and corners with greater surface-area-to-volume ratios than the faces. As a result, the edges weathered more quickly, producing the spherical-shaped ‘goblins’. The rock formations are estimated to be around 170 million years old. I just saw the video of the Goblin Valley vandalism performed by Glenn Taylor and the two other boy scout participants. Over the years, I’ve seen MANY hooligans like this destroy our national parks and monuments. PLEASE make an example of these guys. If you have any ability to press charges against them, please do so. I am so sick of people like this destroying our public lands. Don’t let these guys get away with this sort of behavior. It’s not their place to decide if a rock is going to topple. It’s NATURE’S place to decide (and the state park employees in charge of that park). When vandalism like this is allowed in our public lands, then what are we saving them for? 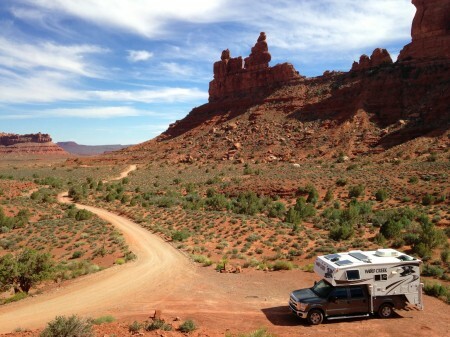 Mello Mike’s RV & Off-Road Adventures: Wow! What a trip! Check out his website and enjoy the beautiful photography! 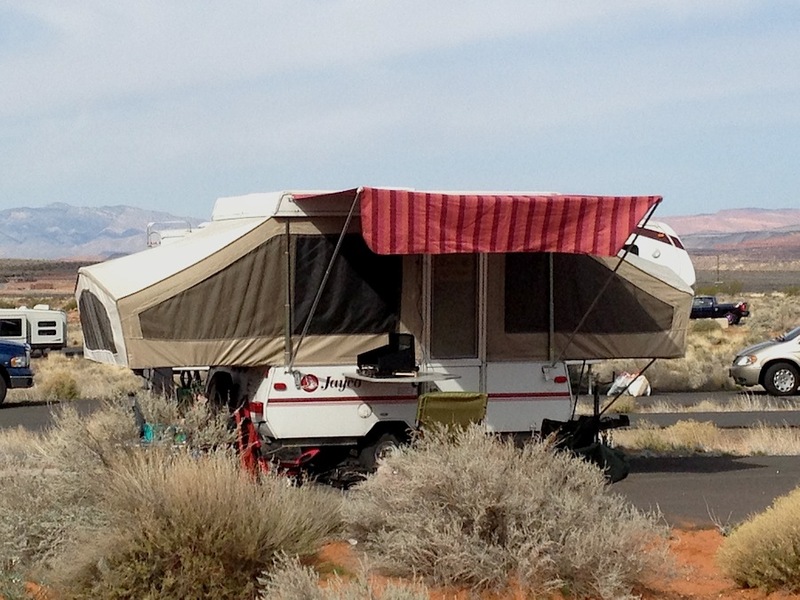 A couple of weeks ago, we went camping down at Sand Hollow State Park in Southern Utah. It was the first time I got to test my homemade awning. It looked GREAT! Unfortunately, it didn’t hold up well in the wind. Just a short burst of wind sent it toppling down. There are two points of weakness in my design: the connections at the top and the connections at the trailer. 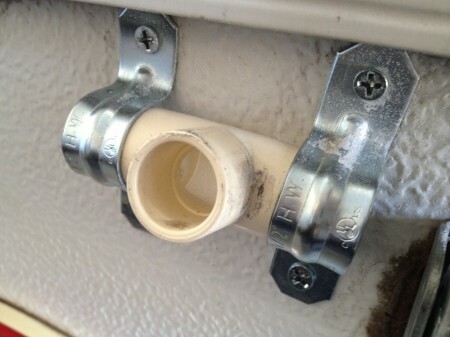 On the trailer, the poles (stolen from my Springbar tent) just slide onto this PVC connector. They worked great in the garage, but there was no wind there. Even the smallest of wind gusts can pop the pole off this connector, so I need to drill a hole in both the pole and the PVC pipe, and add a pin to keep the poles in place. At the top of the awning, it is held on with a pin, but the pin just kept popping out of place, so I need a different connection there as well. I did a pretty good job sewing the awning, so I’m proud of that. All I need to work on is the hardware and this puppy with look good AND stay in place. 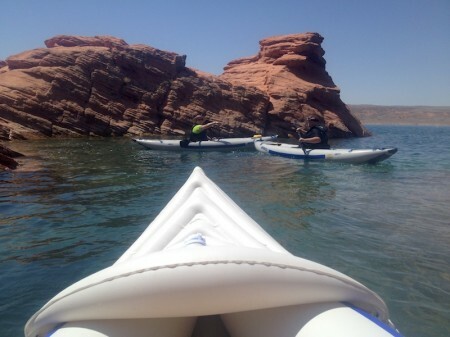 We took the Sea Eagle kayak out on Sand Hollow Reservoir in Southern Utah last weekend and it was a peaceful trip. We watched the people jump off the huge cliffs. It was pretty nervous making. Then, we made our way to the island. There, we found a lovely little hollow where we could snorkel and watch the fish. 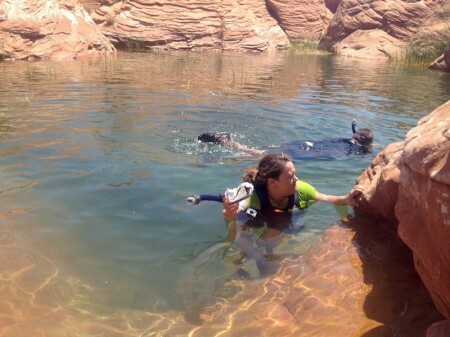 They had NO fear and let us swim right up to them. The only problem that we had was with the kayak. 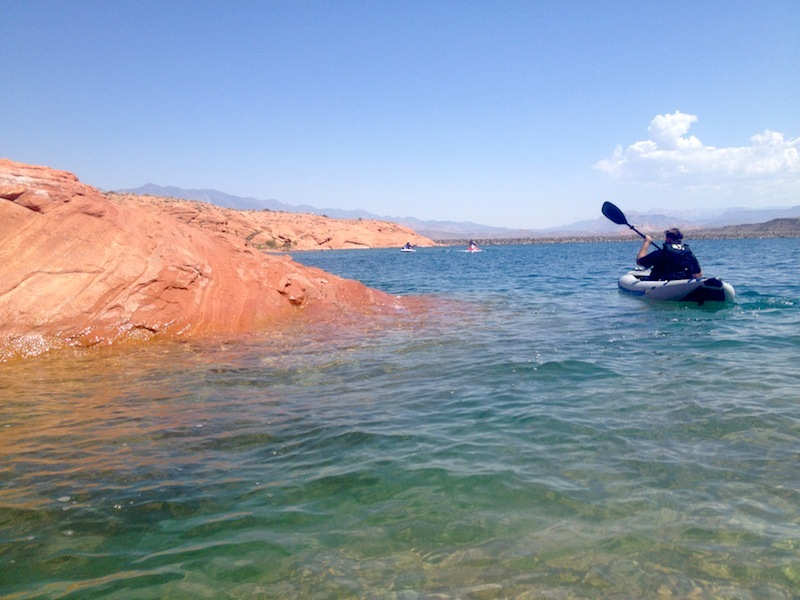 The fuss and burden of pumping up the kayak before we went out was bad enough, but once we got out on the water, our SE 370 kept going in circles. We believe the heat (it was 102 degrees), made it so floppy that it just couldn’t track well. Stacey and Dan did much better with their fancy boats, but our poor little inflatable just couldn’t take the Southern Utah desert heat. 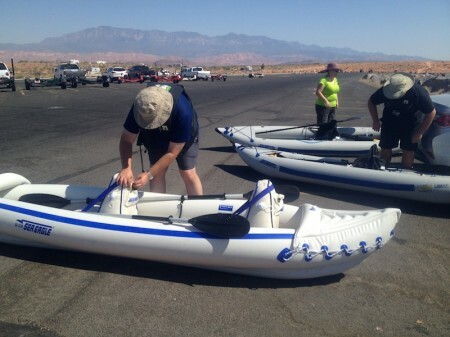 It was a wonderful kayaking adventure, but next time, Mike and I might need something a little more substantial. 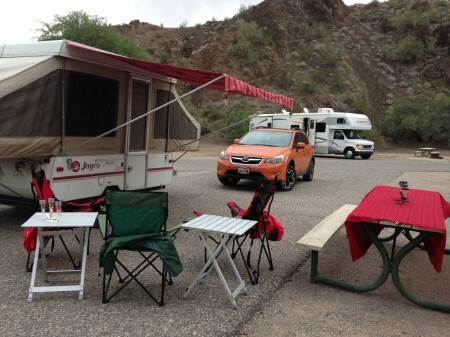 Mike and I have loved how convenient our teardrop trailer has been, but we’ve actually found a site that makes having one inconvenient. 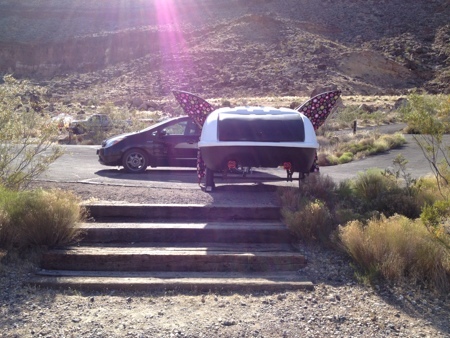 We were at Quail Creek Reservoir and the campsites have a bit of a hike from the picnic table and shade to the trailer. 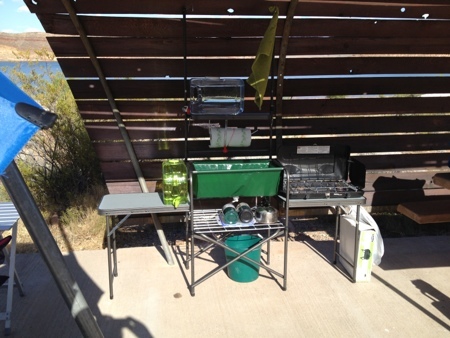 In fact, we can’t use our little galley at all, so we just set up our camp kitchen under the shade. I tried something different with the water in an effort to make a nice water faucet for the sink. 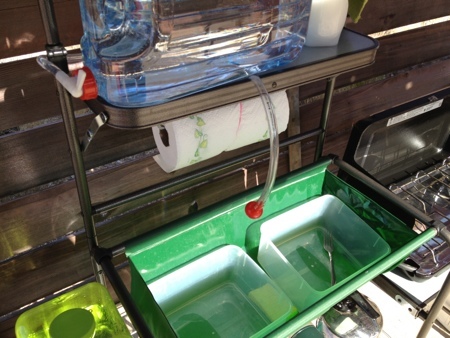 It wasn’t perfect, but it worked well enough to wash our hands and rinse dishes. You can’t beat the view from my bed, though. 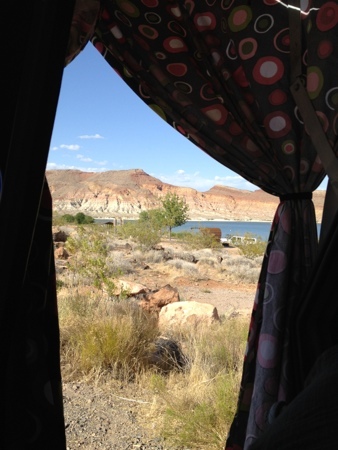 Despite the inconvenient campsite, we had a lovely weekend at Quail Creek and can’t wait to go back! 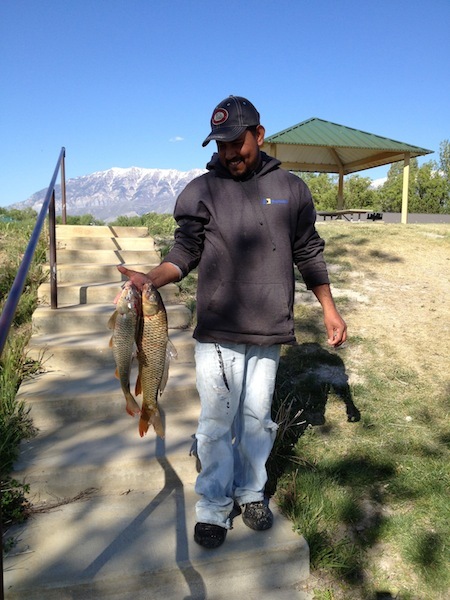 Remember, camping isn’t allowed at Oquirrh Lake. We just filmed our trailer there because it’s so pretty. You’re welcome to stay the day there, fishing and enjoying the sunshine, however. 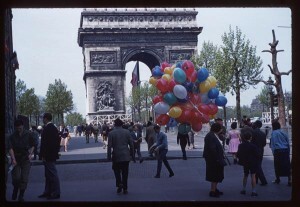 I love to travel and see parts of the world that are different than mine, but the photography collection of Charles W. Cushman allows me to travel not only all around the world, but through the past as well. 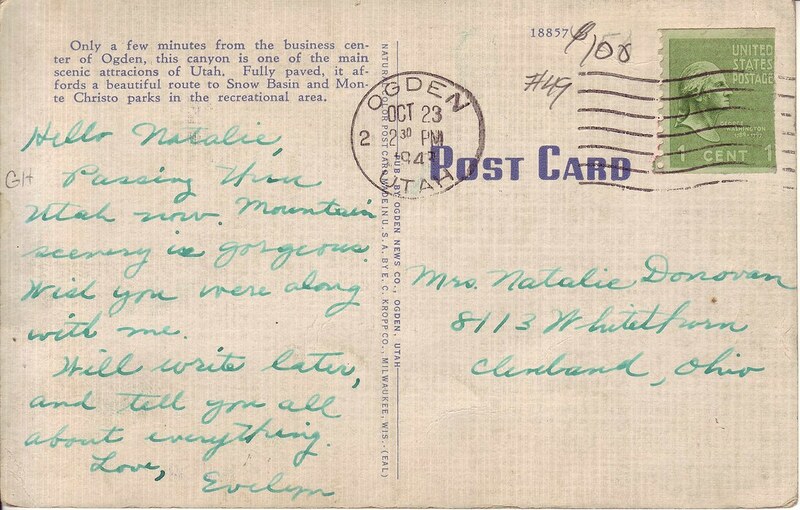 This week’s postcard was sent to Mrs. Natalie Donovan in Cleveland, Ohio on October 23, 1943. 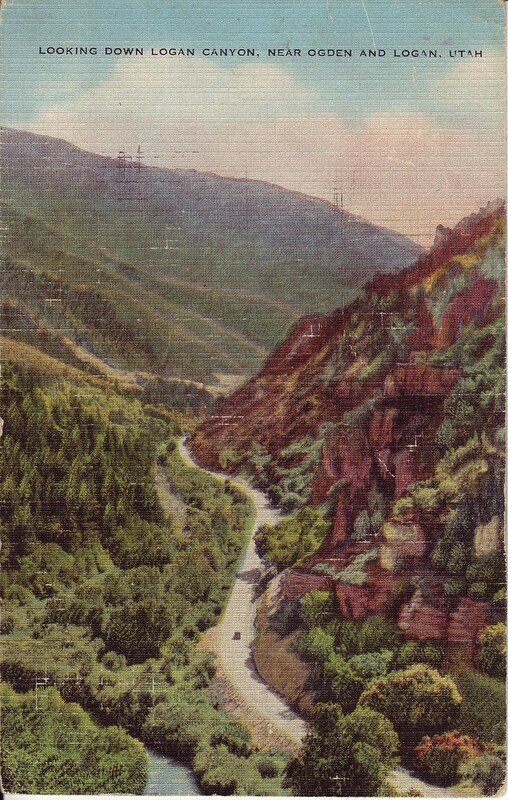 Only a few minutes from the business center of Ogden, this canyon is one of the main scenic attractions of Utah. 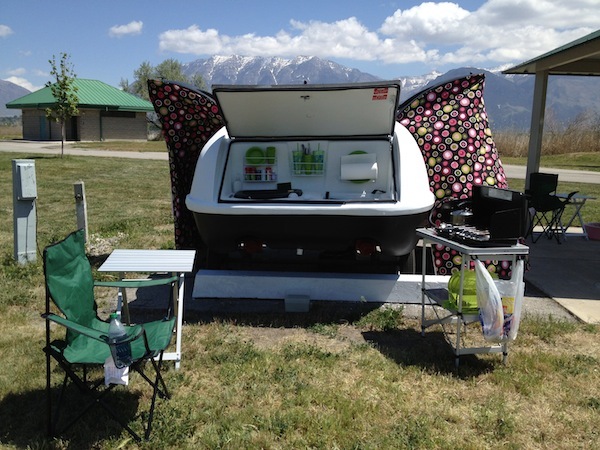 Fully paved, it affords a beautiful route to Snow Basin and Monte Christo parks in the recreational area. Passing thru Utah now. Mountain scenery is gorgeous. Wish you were along with me. Will write later, and tell you all about everything. 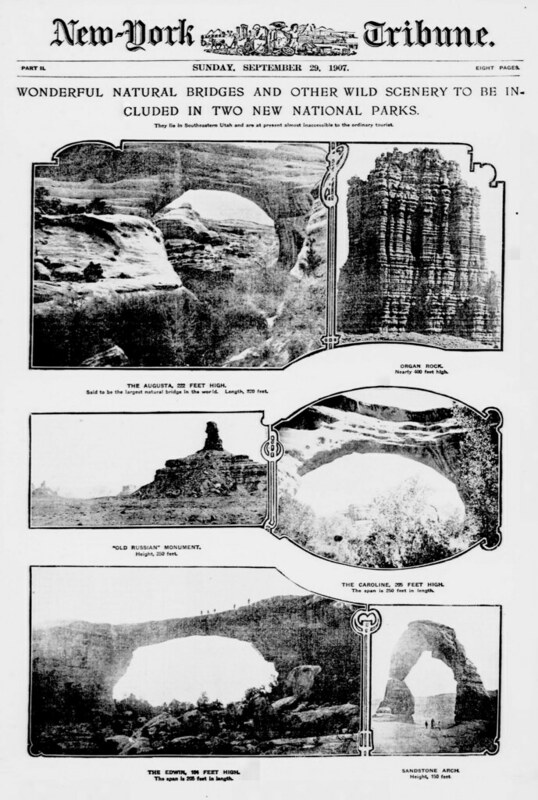 Here is the announcement of the formation of Zion’s National Park in the New York Tribune back in 1907. Wonderful natural bridges and other wild scenery to be included in two new national parks. It’s nice to see how people viewed our national parks one hundred years ago. Instead of complaining that the government is “stealing” our land, the press was excited to share the beauty of the areas that the parks protected. Because of that foresight, we can see these sites even now.